The Q9FNs are the most spectacular TVs I have ever seen. They are truly a revelation when compared to other LEDs on the market. The HDR picture quality is unprecedented in its clarity and brightness and the Smart sound function is a great new addition. 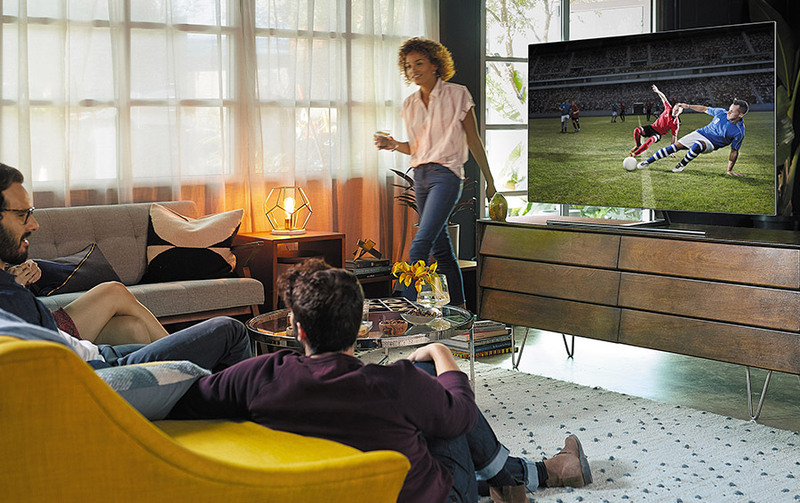 When combined with the innovative ‘Ambient Mode’, cutting-edge gaming features and a fantastic Smart system, these TVs have really raised the bar to another level. 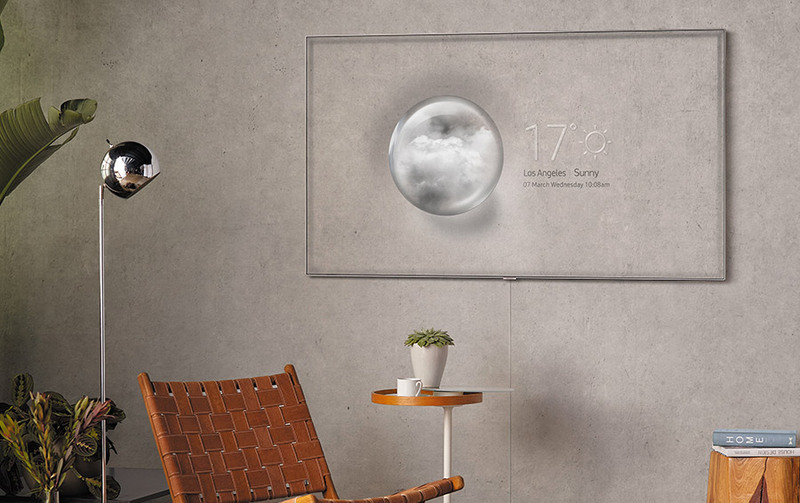 These flagship TVs are of a minimalist build with a muted dark frame that would blend in with any home interior. The understated design is very much based around the concept of removing the conspicuous black screen that you get when the TV is turned off. 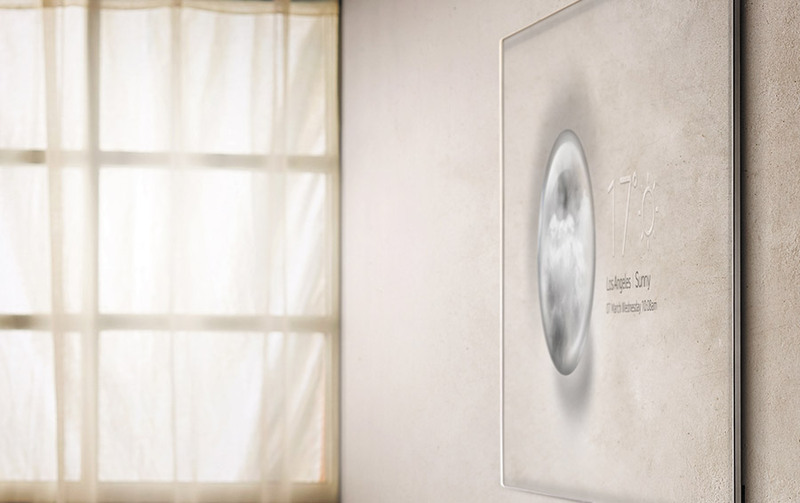 The ‘Ambient Mode’ enables you to upload art work or photos to the unused screen so that all that remains of the TV is a sleek black frame. These are more than just market leading televisions; they also serve as a stylish art / photo frame. Samsung have also ensured that there is no need for spools of cables pouring out of the television by employing impressive anti-cabling measures. An external connection box that means there is only one thin cable leading to the screen with no additional power leads, so as not to detract from the simplistic design wall mount. The 65Q9FN and 55Q9FN offer an impressive quantity of apps with HDR and 4K versions of Netflix, Amazon Prime and YouTube as well as catch up apps for all four of the UK's main terrestrial broadcasters. It is easy to browse and navigate between live TV and on-demand content and the TV provides useful hour-by-hour television recommendations. Connectivity between smartphones and tablets is readily available and there are some new, cutting-edge gaming features as well as helpful voice recognition functionality. 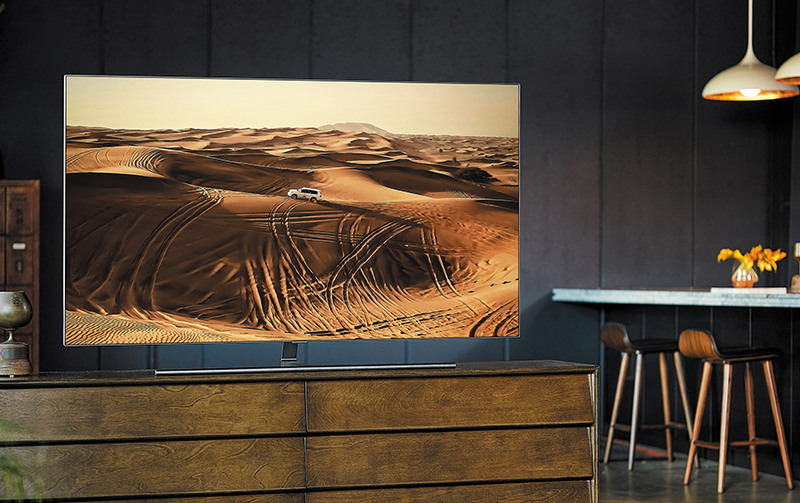 As well as being even brighter and more colorful than last year's Q7, Samsung's 2018 flagship Q9 screens use an innovative ‘Full Array Local Dimming’ lighting system for enhanced contrast. The result is far more impressive than any edge backlight, and when combined with QLED technology produces images of an unprecedented clarity and depth. Samsung QLED Quantum Dots produce a picture that's brighter and more colourful than any other television I have ever seen. The Q9 also does an impressive job of upscaling HD to 4K or SDR to HDR with astounding accuracy and without any plastic skin tones. These HD/SDR TVs really do deliver a consistently spectacular picture quality with the best 4K high dynamic range images available. Stunningly rich black levels sit alongside beautifully rich, balanced and finely graded colours. Also striking is that when watching very bright HDR content, the Q9s can also retain the intensity of the lightest colour, achieving incredible detail and finesse at all luminance levels. The 55QPFN / 65Q9FN’s combination of extreme brightness, wide colour response, unrivalled colour ‘volume’ and outstanding contrast deliver HDR pictures that are simply mind blowing. The sounds quality of these TVs is projected away from the screen in such a way as to create a three-dimensional audio space with depth, height and width. They even feature Smart sound functionality that analyses the content and adjusts the sound accordingly. If you are watching sport, they will create a stadium-style sound, whereas for a film sound will be delivered in a movie-friendly tone. This is a fantastic feature that I felt really enhanced the viewing experience; producing a dynamic, well-rounded and powerful sound without you needing to do anything. Enjoy the Samsung Q9F QE65Q9FN / QE55Q9FN review?